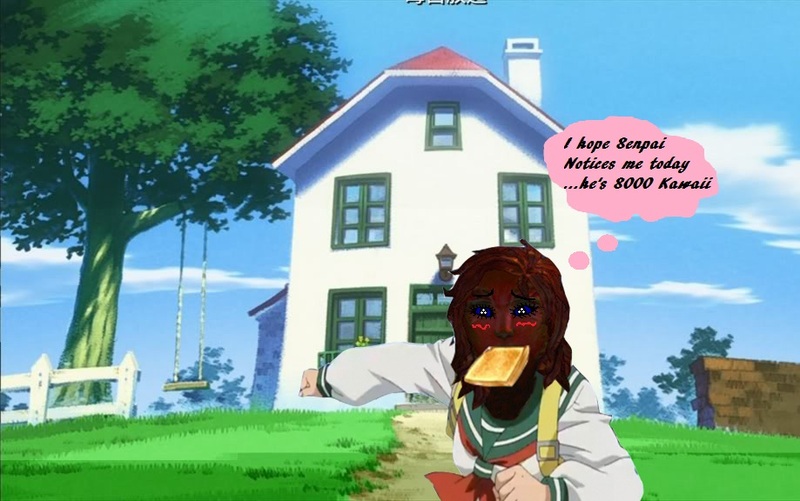 He had long hair once...it was his 'anime meme' phase. He's red and gold, I like him. Nice images. I'll give him a solid McDonald's Fry Carton rating. 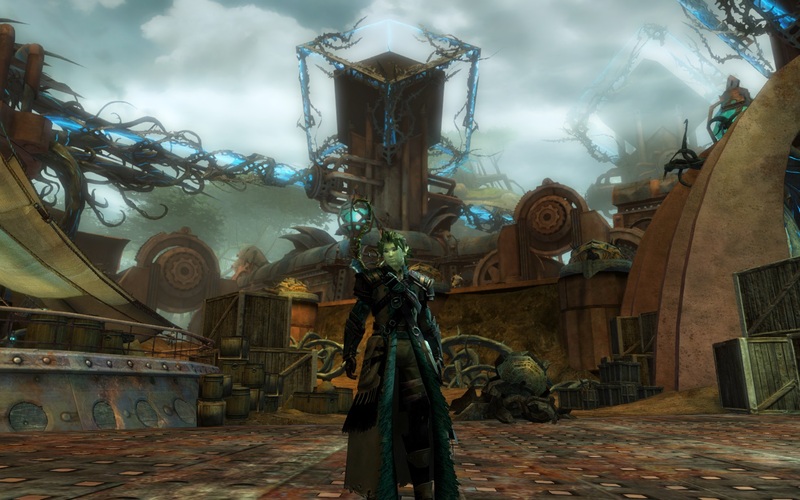 I know this sylvari! Eidolen is very awesome. I love that flute picture, that is beyond adorable, omfg. He gets a minty zest rating like my Colgate toothpaste. 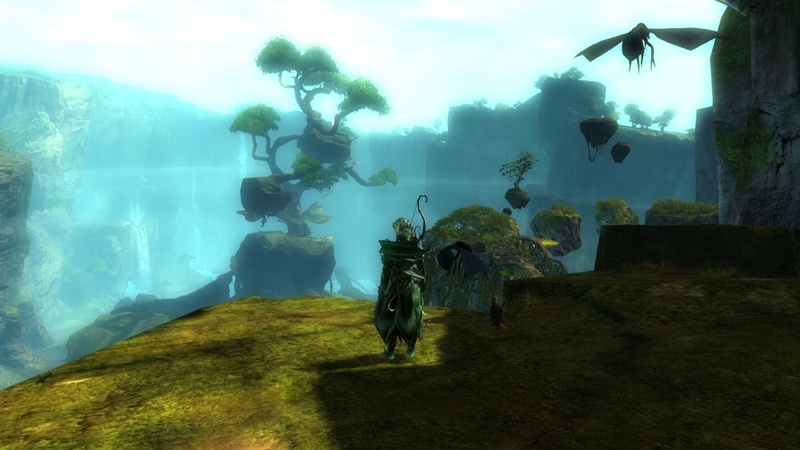 Next, here are four sylvari - but you can just focus on mine. She's the dark one with the orange leaves. Her name is Laf! 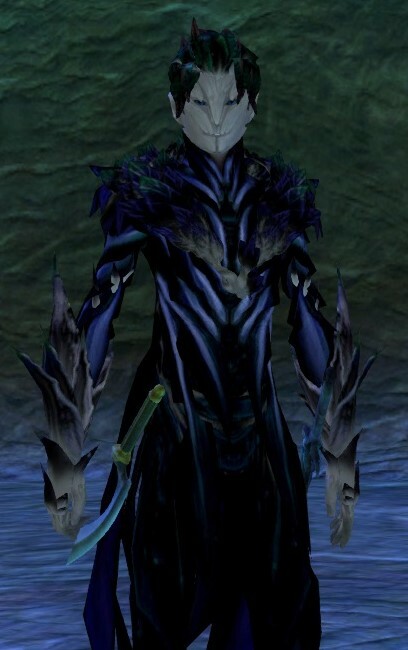 Laf looks like a dark sylvari done right! 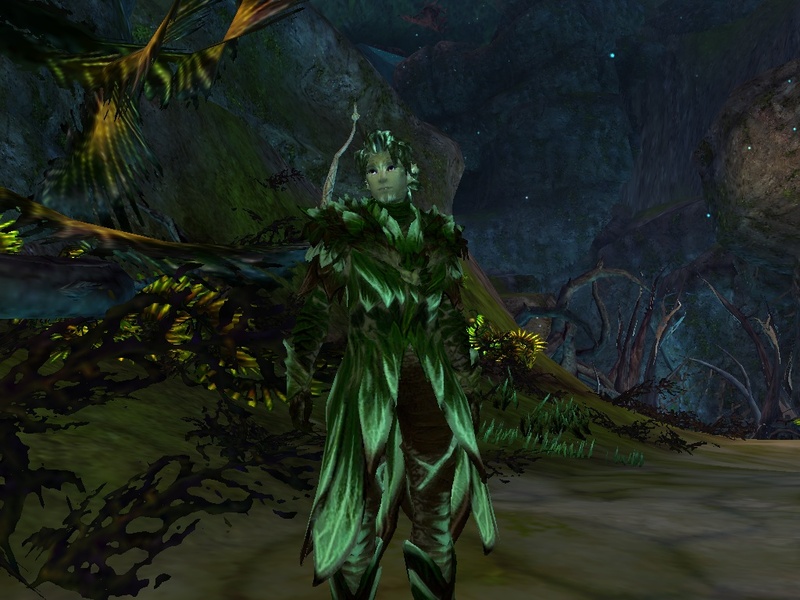 At least compared to my first dark barked sylvari, she looks much better compared to mine. 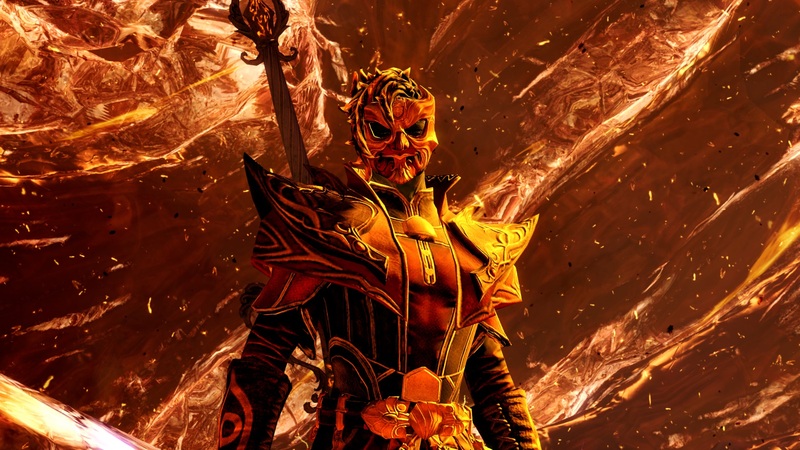 Speaking of which, I doubt anyone has shown a Courtier in this thread? Unless I have missed it, of course. 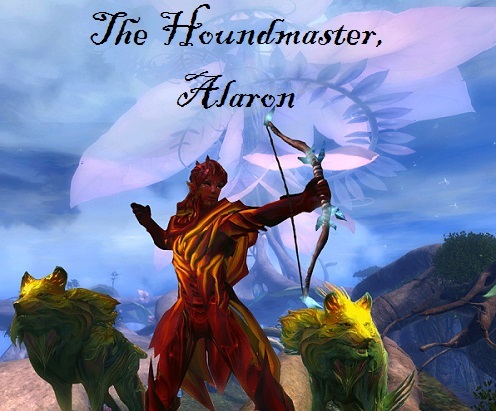 Introducing my kennelmistress, huntress and a courtier Dymphna in all potato quality glory! 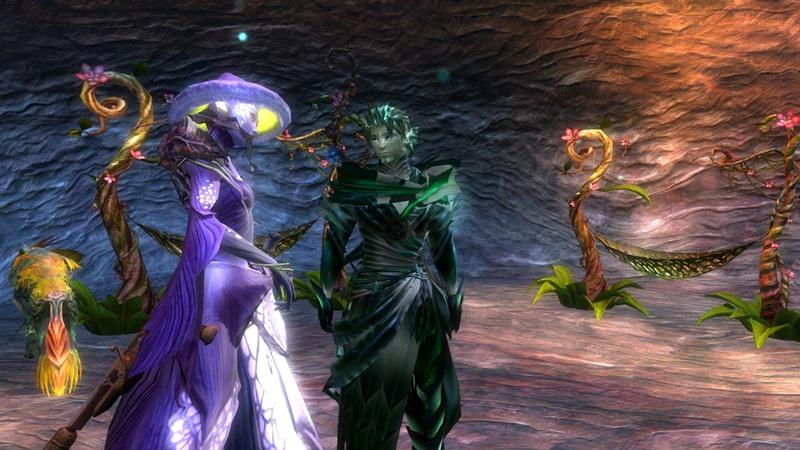 Dymphna looks like an adorable greenvari, and one I wouldn't expect to be a court member. 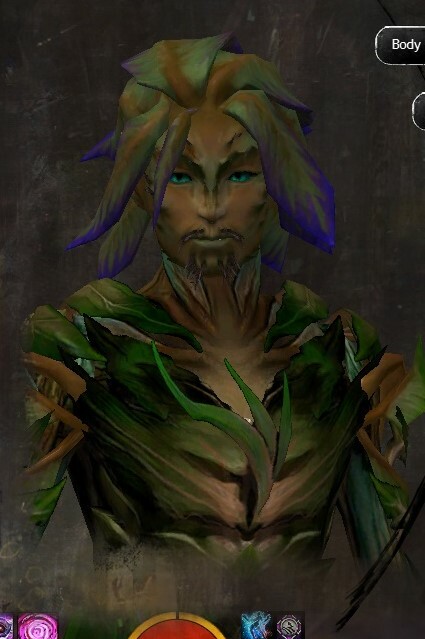 I am almost never on a sylvari, but this one is my pride and joy, Twiggy Sawdust. 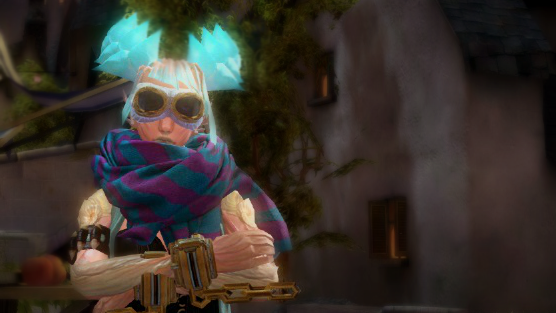 She's a mists arena enthusiasts, bomb specialist and severely stunted mentally. 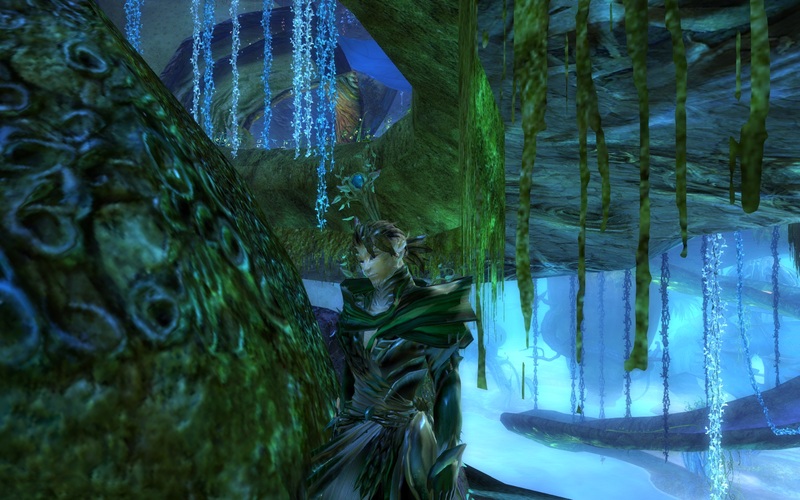 This is due to my other sylvari, Devin, beating her so hard over the head, her cranium was in two almost. The back of her head still has the staples and glue keeping her "skull" together. I LOVE that cotton-candy hair/skin combo! <3 Playful colors on medium classes are so lovely. She's exactly the kind of lass who I'd let blast me into smithereens. I love him. He looks like a psychedelic nu-metal music video that came to life and started wandering the countryside scaring children and doing magic shows. 10/10 for uniqueness, style, and being memorable. 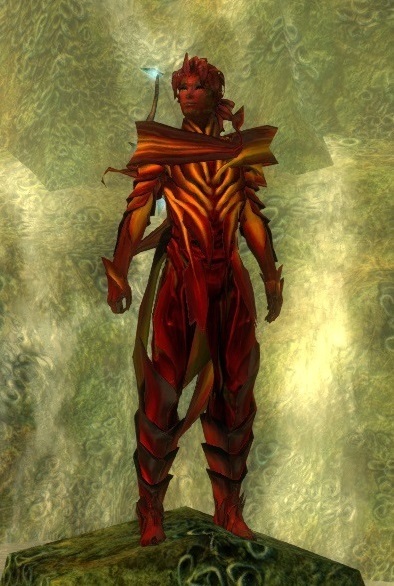 This is Fraisear, he kills things for money. He looks like a total badass, as well as the last person I'd like to meet in a dark creepy alley at midnight. ^^ Gives me the general impression that crossing this guy would easily end up with him murdering your face, working your tendons to make a new bow string and using your bones to craft a knife handle and a few more glove decorations. All while keeping the dispassionate and almost bored gaze I think I'm seeing in the first picture. 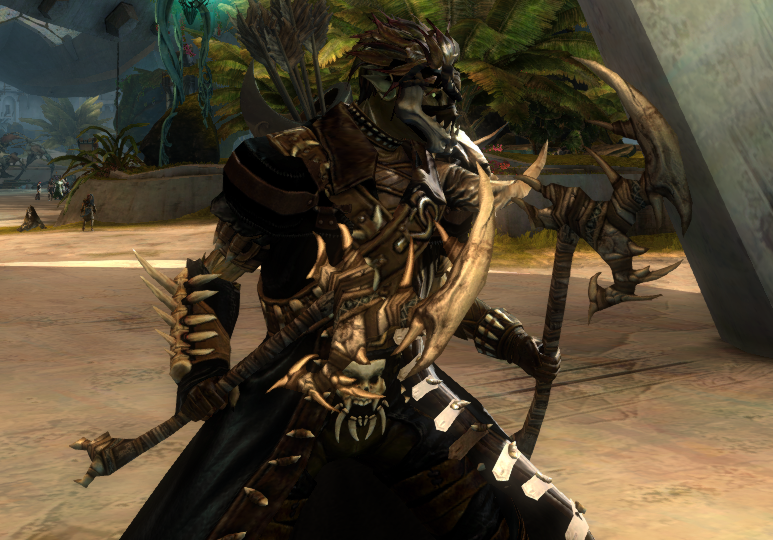 I love how the weapons perfectly match his outfit, too, it's a nice touch - even the simple bow compliments the design very well. Rough, raw and brutal. Time to show some more love to the Nightmare Court! 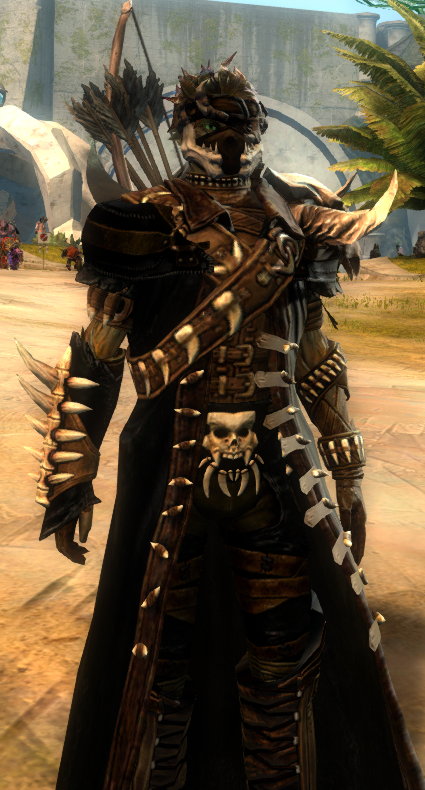 This is my dark paladin, Reithiel. She holds some of the typical knightly values - honour, truth, courage, justice, faith - very close to her heart... a shame she does so in a purely Nightmare fashion, and her sense of what is actually 'right' or 'wrong' is slightly contorted. Bonus: "You - cannot - PASS!!" Reithiel (in alternate outfit and without helmet) and her Duke, fooling around OOC. Aaahh she's absolutely lovely! Her colors match up with her magic so well and the outfit in the top pic is amazing! 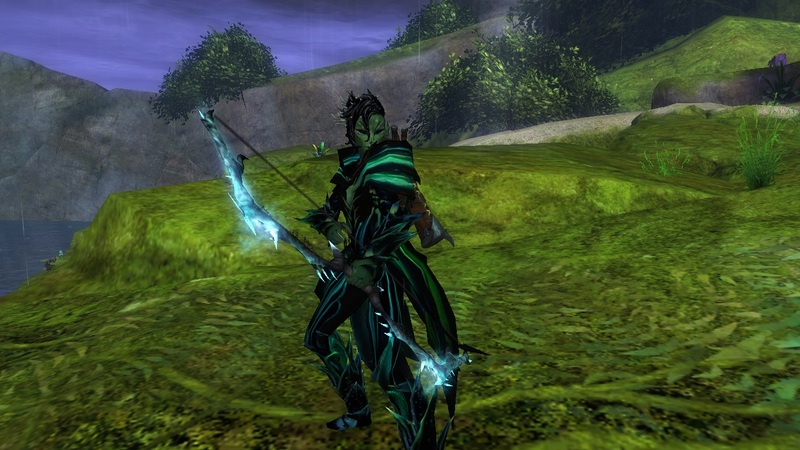 <3 I especially love the helmet (though her fronds are pretty as well), plus the weapon matches well too. 10/10 would do a dark vigil with! 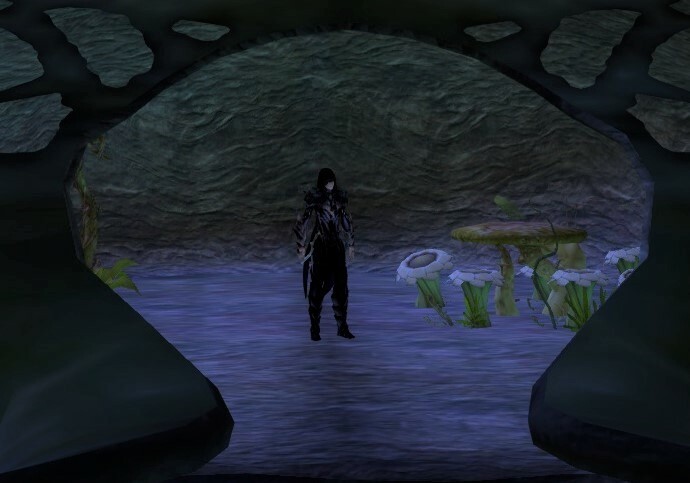 Since we're showing off Nightmare plants right now, I thought I'd toss Idae in! She was captured as a sapling, and is probably a bit scary for a one-year-old. 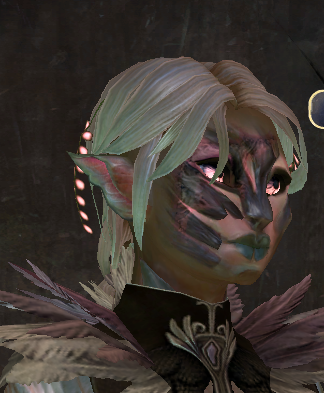 She has a love for honing her Mesmer skills, knowledge and sappy romance novels. Oooh. Scary, she may be, but Idae's got the unassuming look down. And, in some cases, that's a good thing. The outfit gives her a bit of a noble air too, like she really does spend time gleaning knowledge from a pile of books in between teaching her fellow Courtiers that torture textbooks aren't actually meant to be used as a bludgeon for the actual torturing! So, yes. 10/10, would share books with. The necromancer Knight of Corruption is many things - self-serving, aloof, bookworm, part-time torturer - but she's most definitely not a nice person. While she's certainly mellowed out a bit since her early days in the Court, power and status have subdued her drives. Slightly. She still wants power. She's just more inclined to go around people rather than through them to get it. Maybe I'm a little late? 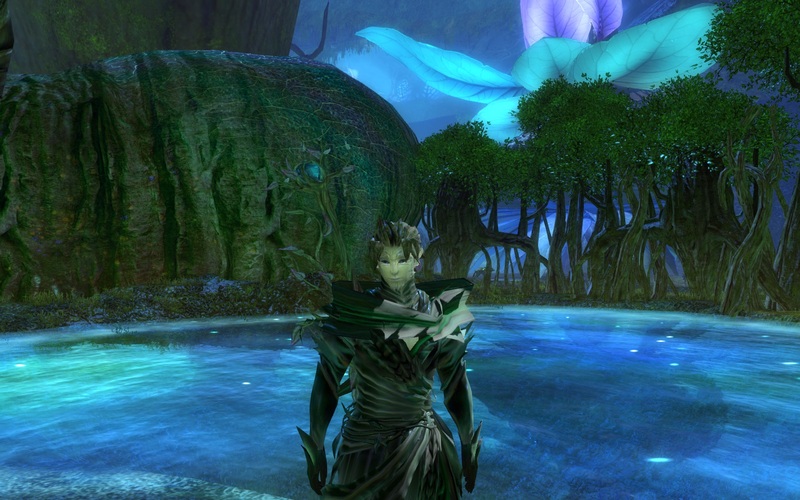 Well, anyways here's my Sylvari, both of them! 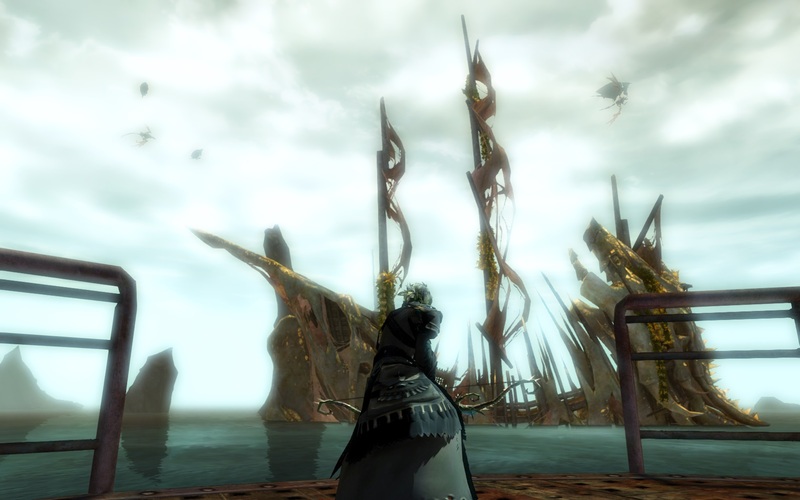 Anyways, Rhaedra's super cool! In a scary way! She'd probably freak Suan out, and as for Mea.... I dunno what he'd do? Probably send her somewhere bad. Though, I have to say that the first picture is WAY more creepy than the second, to me it looks like that could be anyone, not necessarily just a Nightmare Courtier. I suppose that's why personality is half the person, huh? Either that or I hold other people to unfair standards. That said, I'd still give her a 10/10, would probably get stabbed by. Speaking of which, here are mine! Suan is a charmer, a lover, a bard, a traveller.... and now he's a c-c-c-c-COMBO BREAKER! He's a dreamer, though his faith in the Pale Tree was a bit shaken after his blind trust left him open to Mordy (from his PoV). 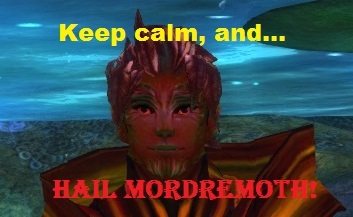 He hates mordrem and the Court with a passion though, rising to even the most innocent of comparisons to them. Fast pics, since I want to sleep! than the entrance, sizing up whatever goes through to match. Of course, that means that whatever did go through is incredibly unstable and..... Eh, I'll save it for actual RP... or his character page, which I'll put up when he has a more final character. I have a Tumblr now! Coolio! 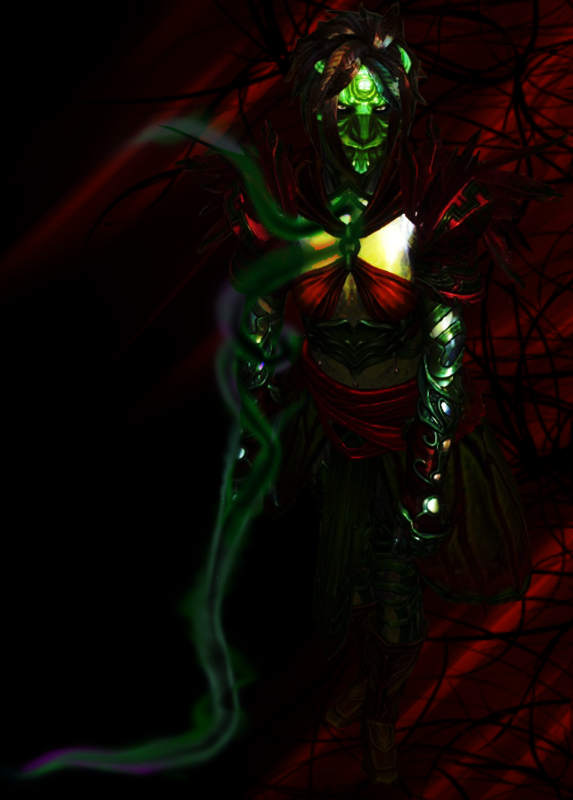 Beth is a feisty former warmaster who makes do with the hand life had given her. Straight-laced and stubborn, Dawnbloom.